Business Fives returned to Edinburgh supported by the Edinburgh Chamber of Commerce with the second heat of this winter season and it saw history made in the tournament. The event’s first ever triple champions were crowned – with law firm Anderson Strathern bagging their third successive Edinburgh Professional Services heat title as they began their bid to be crowned overall winter season winners for 2018. It was the highlight of a highly competitive and entertaining afternoon of five-a-side action at World of Football in the capital’s Corn Exchange. The kick-off saw Bank of Scotland, Addleshaw Goddard, Sky, BlackRock, Freeagent, Wood Mackenzie, Craneware, Bruce Stevenson, Insurance Society of Edinburgh, and Anderson Strathern lining up in the group stages. After some great action and plenty of goals, the teams who qualified for the Champions League semi-finals were BlackRock who were up against Anderson Strathern, and Sky who played Craneware. Anderson Strathern hit form at the right time to reverse an earlier group defeat by BlackRock as they triumphed 2-0 – with top scorer for the tournament Gary Burton adding to his tally. Meanwhile Sky edge past Craneware in a 3-2 thriller before Anderson Strathern beat Sky – their only defeat of the tournament – in the final. Daniel Ferguson from Anderson Strathern was singled out by tournament ambassador Pat Stanton and Hearts legend Gary Locke as the man of the match in the final for a great 2 goal performance. The consolation for the Sky team was they qualified alongside Anderson Strathern for the grand final in Glasgow on 14 March. In the Europa League final – which provides another route to the grand final for teams who don’t finish top in the group stages – Addleshaw Goddard met the Bank of Scotland after they defeated Bruce Stevenson and Freeagent in a penalty shootout respectively. Addleshaw Goddard then held off a comeback from Bank of Scotland to secure a 3-2 win and grab the grand final place. So far the Business Fives winter season – which also fundraises for various charities chosen by the teams through the heats – has raised £4,378 with just three heats gone. The companies will go on to play for the chance to win a Business Fives charity donation for their chosen causes at the grand final with Anderson Strathern playing for Alzheimer Scotland and Addleshaw Goddard playing for MIND. 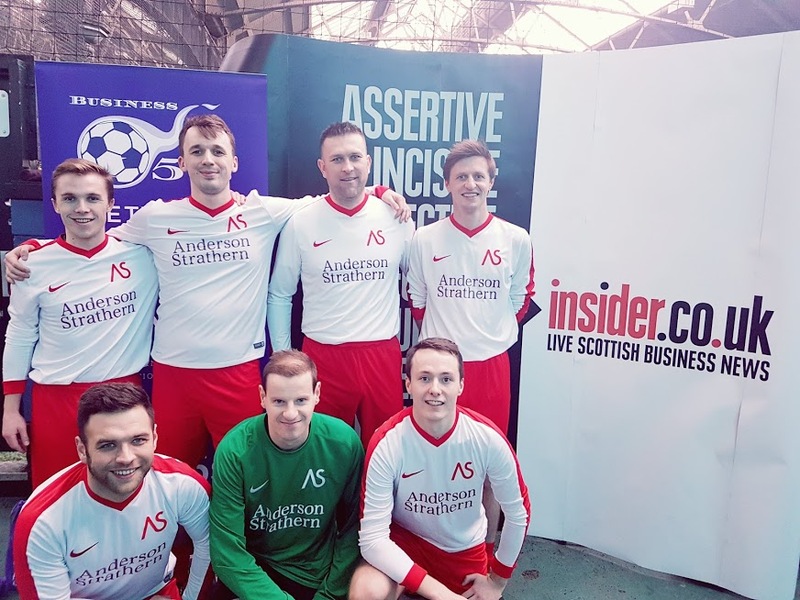 The action for Business Fives – partnered by insider.co.uk and Edinburgh Chamber of Commerce- continues next week with the Professional Services heat at Soccerworld in Glasgow on Tuesday and the Food, Drink and Hospitality heat at World of Football in Edinburgh on Thursday.